When I saw the collection I was actually speechless. 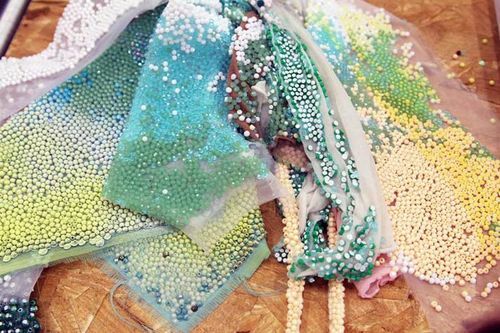 The combination of sheer and also mate materials with (maybe) millions beads is just perfect and really exquisite. If you're wondering about the beads, they are mare plastic beads which made me love the collection even more. Images via here and you can read an interview with Maia Bergman here. I'm really curious whether these are hand stitched! I also asked myself that, I studied them as much as I could from the pictures, in some of the pictures they look glued, but I think they are stitched.. Saw this collection else where too. Amazing detailing and intricacy!